Termites (also known as White ants) are found in colonies headed by the queen under or above the earth's surface numbering from several thousand to millions. These colonies can remain for nearly 30 years and termites make winding tunnels that serve as a passage to and from the colony. There are several types of termites but the most common are the wood eating termites. These type of termites are found near wood sources at doors, windows and wooden cabinets and also attack the carpets and cardboard boxes.There is also a great risk to plant life if exposed to trees such as palm trees and fruit trees as termites have the capacity to destroy whole trees. If left unchecked, some termite varieties can attack upwards from foundation of concrete or wooden structures that can lead to the collapse of buildings. 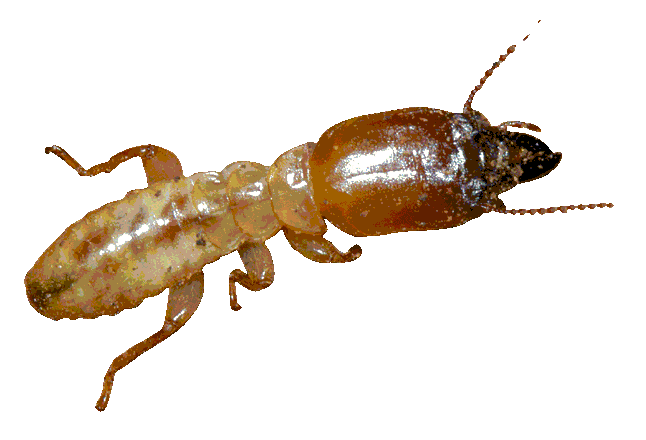 Termite are also known to attack food or grain stores to get the cellulose needed to complete their life cycle. Any sign of termites above on the surface call for immediate action as it is an indication that damage has started deep down. Household pesticides: Sprinkle in the affected areas directly with follow-up in the work of this process every two to three days. Bridging cracks and openings: It is very important to fill all the cracks and openings in which the ants are connected to them through a winding tunnel to the colony. Once the cracks are filled, the connection to the colony is interrupted preventing them from approaching the surface.